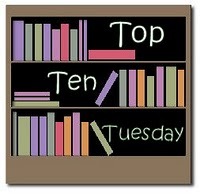 My Favorite Childhood Reads [Top Ten Tuesday] – my books. my life. It is choose-your-own-adventure day at Top Ten Tuesday and participants are picking from their favorite missed topics. 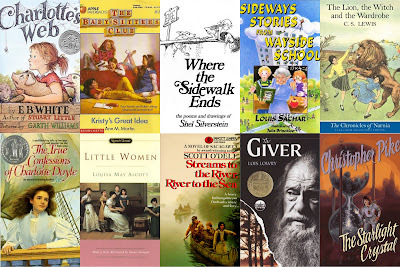 I read a lot as a kid, so when I got to choose my own Top Ten Tuesday subject today, I went with the very first topic – Top Ten Childhood Favorites. This is roughly in the order I read the books and really only touches the surface of what I read as a child. I can’t tell you how many times I read this as a kid. Confession: I used to read just the end when I needed a good cry. And it was actually the baby spiders flying away that would get me bawling. I devoured these as a kid. The regular series, the mysteries, the Super Specials – I read them all. And I loved the prequel released last year. I was in love with Shel Silverstein’s poems. I read them over and over and over. Such fun. These are also stories I would read multiple times. Nine-year-old me found them absolutely hilarious. I loved to slip away into the magical world of Narnia. I read this book in 5th grade and fell in love with it. I once had lunch with my principal and gushed about it instead of the book I was supposed to discuss. My Aunt Martha gave me this book one Christmas and I am grateful to this day. It’s a beautiful telling of Sacajawea’s story. I read this one in 6th grade. I may not have known the word dystopia at the time, but it was my entry into the genre I would end up adoring. I’ve expressed my feelings for this book before. I once read it beginning to end twice in one day. I am afraid to re-read it for fear that it is actually less than amazing. Oh, I just loved the Christopher Pike books, and when my daughter was old enough, I gave her the entire collection. Now she loves them too! So glad to see that name on this list! I LOOOVED Sideways Stories and Babysitter’s Club! Great list! Brings me back to my childhood.I was thinking of re-reading the True Confessions of Charlotte Doyle a little while back–it was one of my favorite childhood books and I can’t remember why! I can relate to Charlotte’s Web. That book was a much loved book in my house. I even named my first cat Charlotte. But the rest of my youth was spend on ghost stories and Judy Blume. And Nancy Drew. I feel regretful that I didn’t read more classics. I read a ton of Judy Blume, too. Some Nancy Drew. These are some great books. It makes me want to go back and re-read some of them. I love revisiting my childhood reads. They remind me how I fell in love with reading. 2,3,4 and 9 were some of my absolute childhood favorites as well! I also loved anything written by Roald Dahl. Oh, I forgot about Roald Dahl. I read ALL of those books. All except 8 and 10 were my favorites growing up! I love your choices. You are too funny! I actually still shudder at the thought of the baby spiders flying away. I can’t even watch the movie. Spiders, even CGI spiders or wonderful friends like Charlotte, make my skin crawl and my stomach churn. I am on my third copy of Little Women, as I’ve worn through all the other copies from reading them so many times. But I love that. It is a sign of a great book. Here is my Top Ten list for this week. I LOVED The True Confessions of Charlotte Doyle. I could totallu go for a re-read right now. I’m still in love with Shel Silverstein. That’s a great list. Mine would look completely different, but then I’m not from the US 😀 I’ve only read The Giver recently, but now I can see why everyone loves it so.